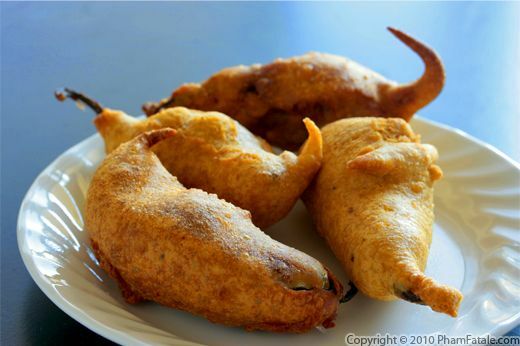 My father-in-law really loves spicy food, so I thought I would surprise him with stuffed mirchi pakora, which are whole green chile fritters. 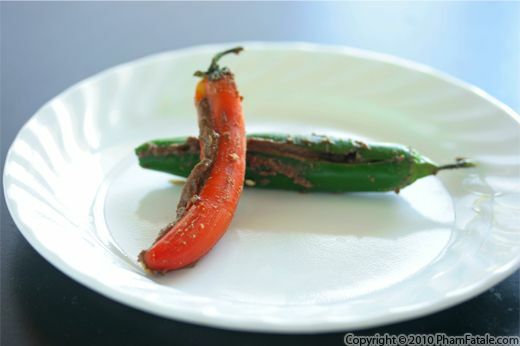 Before getting started, I had to estimate the level of spiciness of the chiles. 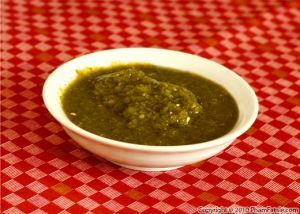 It turned out the green chiles we bought from the Indian market this week were painfully spicy. So I made an incision in each chile and removed all the seeds. The preparation method I learned from Lulu’s grandmother involves stuffing the chiles with tamarind paste, then dipping them in (besan) chickpea batter before deep-frying them until golden brown. I have to admit I didn't try any, but in my defense, even Lulu, Daddy and the girls found the peppers really spicy. Don’t get me wrong; they really enjoyed them even though the girls ended up chugging milk to help offset the spiciness. I’m just saying, you’ve been warned! Using a paring knife, create a 3-inch incision in the chile peppers. Depending on the spiciness, you can remove the seeds or not. This time, I removed the seeds (don't forget to wear disposable gloves). Set aside. In a bowl, combine the tamarind, jaggery, ground cumin, coconut powder (if used) and ¼ teaspoon salt. Mix well. In a mixing bowl, stir together the chickpea flour, rice flour, baking powder, chili powder, turmeric powder and the remaining salt. Sift the dry ingredients. Add the cumin seeds and a little cold water to the dry ingredients and whisk until incorporated. It should have the consistency of pancake batter. Pick up the chile by the stem and dip into the pakora batter to coat completely. 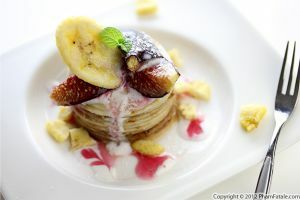 Allow the excess batter to drip back into the bowl. 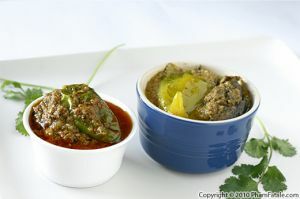 Drizzle an additional teaspoon of pakora batter over the chile to ensure that it adheres well and place in the hot oil. Repeat the same procedure for the rest of the fritters. 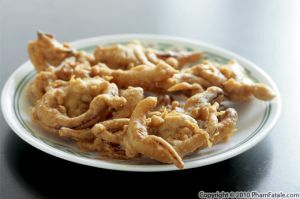 Place the pakora one at a time in the hot oil; cook up to 4 pakora per batch. Fry in batches. Make sure the chile fritters don't touch each other. Lower the heat to medium. Deep fry for 2-3 minutes per batch. The fritters will start to pop and increase in volume. Use a splatter screen to prevent the oil from jumping everywhere . Flip each piece using a spider skimmer and cook for about a minute more until golden on both sides. Delicately lift each pakora, draining as much oil as possible and transfer them to the cooling rack. Continue with the rest of the chiles. 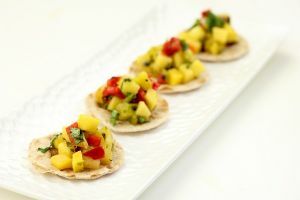 Serve immediately with various chutneys on the side and a mix of chopped red onions, cilantro and chopped tomatoes with lime juice. Add a small amount of turmeric powder so as not to alter the flavor of the batter. 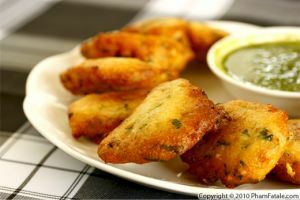 It's used as a natural food coloring to make the pakoras look more vibrant. You can find coconut powder in any Indian stores. I buy jaggery, also known as gur (palm sugar) from the Indian store. 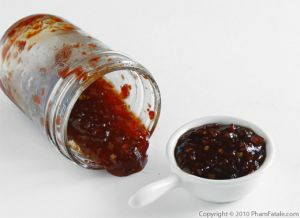 It comes in large chunks that are usually sold by the jar. If you can't find any, you can use brown sugar or regular granulated sugar instead. We make our own rice flour. You can find rice flour in most Asian stores, but I prefer grinding my own. I get finer flour using the Nutrimill brand mill. It's very useful to make any kind of flour. It's a great complement for gluten allergies as well. I make my own flour with buckwheat, oat, sorghum and spelt. If you don't have any rice flour on hand, just omit it and increase the amount of chickpea flour. I also made the mirchi bhajis stuffed with paneer. The cheese pairs nicely with the spiciness of the chiles. It's a quick Indian recipe. 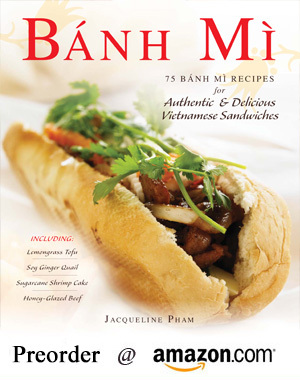 Published By: Jacqueline Pham on August 11, 2010.